Wallets and belts are not just accessories that people use every day but have become a necessity. They have become so vital that you never forget to carry them every time you leave your home. You carry important essentials like Credit cards, ATM cards, ID proofs, etc in your wallet. Leather wallets are always a class apart and will never go out of style. These wallets for men come with separate slots to keep your money, cards, and coins. If you are looking to gift your partner or loved one something special, wallets and belts are always a good choice as they will be of use to every man. 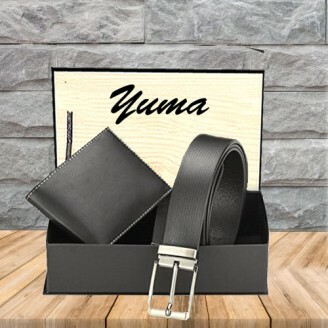 A perfect present for the one you love, the elegant and timeless belt and wallet set a wonderful way to show your love.